Carrots are a popular and versatile vegetable grown on many farms in New York. Fresh market growers have a wide range of varieties available for production intended for farm stands, farmer's markets, school lunch programs and wholesale markets. Fresh market carrots also come in a rainbow of colors. Roughly 2,000 acres of carrots are grown in Western, NY for the processing market. Blunt-tipped Nantes varieties are preferred for sliced, processed products and blocky Chantenay or Danvers types are used for dicing. Obtaining long, straight, smooth roots can be difficult. The best soils are light-textured with few stones or well-drained muck. Good soil health is also important as excess moisture and/or compaction will limit root growth and quality. 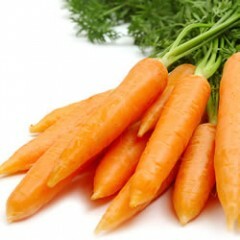 Insects, diseases and nematodes can also injure carrot roots.